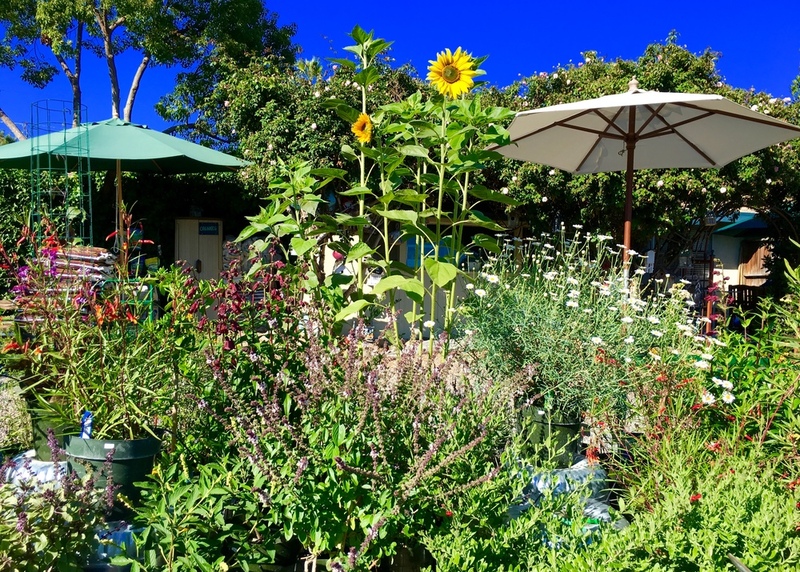 Pearson’s Gardens & Herb Farm offers a spectacular collection of Herbs, Vegetables, California-Friendly Native, Naturalized & Water-Wise Blooming Species, many never before available to the home gardener. Upon entering through the nursery gate, you will discover a panorama of garden delights. Gaze upon the greenery and flowers. Listen to delightful songbirds twittering away in sheer abandon. Breathe in the wonderful fragrances wafting through the air. Feel textures – downy soft, waxy, prickly, and pebbly…. Savor exquisite flavors, fresh and bursting with life. Fancy your imagination with timeless treasures of yesteryear. Explore pathways meandering through Lavender Lane, Sage Street, Yarrow Terrace, Mint Meadow, The Strawberry Patch, Feline Fantasyland, and the adventure goes on and on…. Be sure to say hello to our four-legged friends - Tonka, the cat, hangs out with the ever-growing herd of Russian Tortoises (30 last count) near the raised-bed garden. Tasha, Tiki, Tobey, Touchet, .... Got the idea? Check for new hatchlings late spring through summer. Lastly, stop by the rabbit hutch tucked in the shade of the pomegranate tree where Guinevere and Avalon (2005-2015 RIP), the mini rex rabbits, reside comfortably hidden under the foliar canopy late spring through fall. If you don't find them there, they are keeping a watchful eye on planting in the potting area. Every plant in the nursery is grown with intentional care and pride from start to finish. Seeds are gathered as they ripen. Cuttings are clipped from mother-stock. It all happens right here. Hand propagated with special care. Hand cultivated and nurtured under the watchful eye of the Pearson growers. Grown in rich, aged, live, organic potting soil - Happy Frog by Fox Farms from Humboldt County! Never forced - You will always find outdoor grown, seasonally appropriate plants at Pearson's. We grow them strong and hardy to insure your success! Balance Ecosystem - Pearson's Gardens promotes a healthy, natural environment for all by maintaining an ecologically balanced ecosystem through the use of beneficial insects, pollinator species, catch-crops, and insect screening. Organic pest control products are used as a last resort. We do not use any chemical pesticides, fungicides, growth regulators, or hormones.